According to Wikipedia: "Pay-per-click, also known as cost per click, is an internet advertising model used to direct traffic to websites, in which an advertiser pays a publisher when the ad is clicked. Pay-per-click is commonly associated with first-tier search engines." Pay per click advertising can be a powerful way to grow your online audience, especially in recent years when organic search results have become harder to chase high page rank. You want someone with experience that you can trust to get you the audience your growth depends on. You've come to the right people! We will look at your goals and objectives and formulate an affordable, actionable plan that will work! Search ads are an inexpensive, effective way to drive interested visitors to highly targeted landing pages in order to convert them, and capture their contact information for further marketing opportunities. 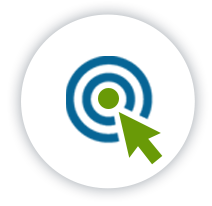 Remarketing lists for search ads (RLSA's) enable you to customize a search advertising campaign so you can begin to target more and more qualified users who have already visited your website. Properly used, RLSAs may offer better ad spend, better converting visitors and consequently, better outcomes. Facebook ads are specific and offer great results! You have been running your Google Adwords search ad campaigns for awhile now, did you know you can put a Facebook tracking pixel on your site? This pixel allows you to target traffic that visited your website, and market to that traffic within Facebook and Instagram inexpensively and with great potential returns. We are knowledgeable about Facebook advertising and would love to work with you! Did you know some qualifying non profits and economic development agencies qualify for Google's Adwords Grant program. The program offers a generous ad spend of $10,000.00 a month for SEARCH ads. We have a lot of experience in this. Let's see if you qualify! You’re an economic development agency, and you think you have an audience on LinkedIn. We can help you grow it. Our ppc experts have experience across the social channels you want to grow your presence on. Let us know what your questions are! We will schedule a one on one session. As the head of the marketing and development department at a small private school, I don’t have time to learn every aspect of Google Adwords & learn the language. H2 Studio has been the perfect strategic partner getting us results, but also teaching us a lot along the way! The online search engine marketing process (SEM) is hard but works. We will partner with you! WE understand how search engine optimization and PPC work together to grow audiences, and YOU know your business. We will work together to get you the measurable, results-driven outcome you want. If you work with us you may even get your hands dirty in data. It will not only be a fun, learning experience that will help you with your present challenges, but you will gain an understanding of valuable, career advancing tools.